You are currently browsing articles tagged relief. Holy Week has come and gone. If you’re like us, you’re probably still basking in the joy that comes with the comprehension of Christ’s work of redemption on the cross and the hope of eternal life that His resurrection brings. More than that, the afterglow of Easter Sunday Morning encourages us to share with others the reason for this hope that we have (1 Peter 3:15), but the increased urge to share comes the with the urgent need to know how. So many times it can seem like we have a joy unspeakable, to borrow the words of the the old hymn, a hope that we feel we’re unable to share. In 1 Corinthians 9:22 Paul states: “I have become all things to all people so that by all possible means I might save some.” It is a call to enter in, to identify and empathize with a community as a means to reach them. It’s easy enough to agree with this concept, but difficult to put into practice. However, our time with the ministry of Sustain Hope has made the emulation of Paul’s message a bit easier. From March 28th to April 6th, Andy Rogers and Frank Mayes from Sustain Hope held services and workshops designed to teach pastors and other leaders how to use simple methods to solve big problems, from water purification to food preparation all the while building bridges to help present the gospel. One such example was a simple fly trap, made from a common plastic bottle and a piece of fruit or a dollop of honey. During the rainy season, from June to November here in the Yucatán, flies can be a big problem, especially in the open air kitchens that many still use throughout the state. The trap provides a simple solution to a common nuisance, but it also serves to illustrate the danger of sin. In the same way that the flies are attracted to the bait of fruit or honey, so sin can be very attractive, but just as the fly is unable to escape from the trap, so sin can have grave even lethal consequences for those who fall under its influence. Imagine the lasting impact such an illustration can have as flies accumulate within the trap! In this and many other ways, Frank and Andy shared throughout the week. It was a joy to host them and translate for them as they brought new ways for our ministers to get involved with their communities meeting physical needs while conveying spiritual truths. Interested in seeing more? Take a look at our photo gallery from the week. If you like, you can also download our latest newsletter in PDF format, featuring Sustain Hope. “Leave if you can!” That is the translated name of Salsipuedes one of the two towns that we visited on our medical relief trip to Tabasco. 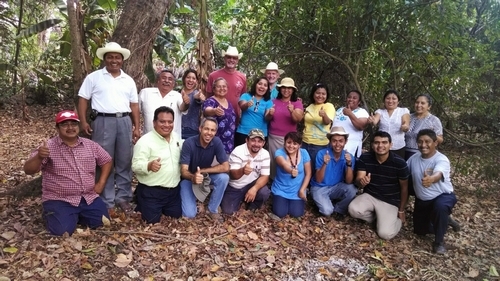 The village of Salsipuedes is situated on the Grijalva River in the Centla of Tabasco, a wetlands region of the state that’s three hours from the capital, one hour on good roads and two on what many would consider “off-road conditions,” but even more overwhelming than the distance to reach this place was the need that we met when we arrived. Sandy Kazim, the organizer and one of the medical providers of the trip told us that for much of the time she felt as though she was running an ER instead of a medical clinic. Four children in the same home with bronchitis and a woman who had recently miscarried were some of the most difficult cases, but case after case of skin infection and other diseases kept the medical providers working long past sunset, the time that we were told we had to leave for the sake of our personal security. Equally as tragic was the spiritual condition of the site. There were reports of active witchcraft taking place and a general look of hopelessness on the faces of many. “Leave if you can” –the name seemed to fit. Still, that’s the funny thing about the God that we serve. Of all of the needy places that we could have gone, He sent us to the town of Salsipuedes. I think perhaps it was because, even though others had given up on that “Godforsaken” place, He hadn’t. He sent us there as an extension of His love in a tangible way. I had the chance to enter into homes with several of the students of the Bible Institute while the medical team treated the sick. And as we passed from house to house, entering into their world, I thought of what Christ did for each one of us. He left His glory to live among us, to experience what we experience and to give us the hope that comes from a relationship with God. We in turn were serving as his representatives, offering the same hope that we now enjoy in a place where hope seemed for many to be a distant memory. I spoke to many and told them that, although they might not have expected it, God had sent us to them specifically to let them know that He had decided to stay in Salsipuedes and that he was looking for hearts in which he could live. We prayed with many as they wrestled to take those first steps toward a relationship with their Creator. So is the work in Salsipuedes; the population is run down, too tired to hope, too tired to dream of something better, and perhaps easily placated with the counterfeits that false religions or momentary escapes like drugs and alcohol can provide. Still, I believe that something began in the heart of those that we touched on that Friday. They received a taste of the love of God, and I believe that through the persistence of the pastor and the congregation that is serving that town, together with the regenerative power of the Holy Spirit, the very character of that town can change. In fact, I’m looking forward to the day when they invite us to the official name changing ceremony. When one thinks of the needs that arise after a major natural disaster, several things come to mind. In the case of floods, for example, I think of material possessions being ruined or swept away by flood waters, no clean drinking water for awhile, unavailability of food, loss of homes, and possibly the loss of life – both people and animals. Recently, the state of Tabasco was hit by major flooding. Thankfully, several people came to their aid, both from the government and through organizations. However, when we inquired concerning the needs of the people, we were told that they had received a lot in the way of provisions, but that medical attention would be needed down the road. That’s where we come in … Last week our family had the opportunity to join with fellow missionaries Paul and Sandy Kazim, medical professionals and Bible school students from the state of Yucatan in order to go to meet the medical and spiritual needs of their fellow Mexicans in Tabasco. We were hosted by pastors and church members during the 4-day trip while we focused the outreach on 2 towns that had requested help in these areas. Not only was medical help available, but our team also provided ministry for the children, youth, and adults through skits, songs, balloons, sharing of the Word of God, door-to-door evangelism, and prayer. Upon returning to Mérida, I reviewed some of the videos and photos from the trip and would like to share a short film that hopefully captures the essence of our visit. You won’t see me since I was behind the camera, and you won’t see Dave, either, since he along with some of the Bible school students visited homes, meeting the spiritual needs of those who couldn’t come or who hadn’t heard about the medical outreach. But you will see our kids involved in ministry as they played an important role and were a blessing to many. Also, the film is set to music, a song done in Spanish. The song speaks of being available and ready to be used by God for the things He wants us to do, giving Him our time, our hands, our voice, not wanting Him to pass over us because we are available for His purposes. It is sung by Jesus Adrian Romero from his album, “El Aire de Tu Casa.” My prayer is that this short film serves as a reminder of the needs all around us and that we, through the help and grace of God, are the answer to those needs. May God bless you as you allow Him to use you. You can view it in this post above or on GodTube. We’re on our way for a three-day relief trip to Tabasco with no time to type. What could be a faster way to relay the story? How about a video blog? Take a look at this latest offering and please remember to pray for those affected by the flood in Tabasco. Mondays are usually a low-key day for the Godzwa family. The day after ministry is usually reserved for catching up on household items or replying to correspondence. I had a post planned about the evangelism seminars that we have been leading. But a telephone call from Paul, our mentor missionary here in Mérida, broke the routine. “Dave,” he said, “the situation in Tabasco has gotten out of hand…” The situation he was talking about was the flood that Mexican President Felipe Calderon now calls Mexico’s worst recent natural disaster. If you have not had the opportunity to see the images of the Mexican state of Tabasco that CNN has been broadcasting, please understand that the inhabitants of this area, which is located about 300 miles from our current location in Mérida, are dealing with a true disaster. Due to unseasonable heavy and continual rain, several rivers have flooded their banks inundating businesses, homes, schools, and churches. News reports put up to 80% of this low-lying state currently underwater. Calls to church leaders in this district have returned reports of lower lying areas completely underwater, of many homes and churches with more than five feet of water in them, and of flooding so high that even people who live on the second floor of a building have found shelter elsewhere because there is no access to their homes. So to one side moved the household chores and unanswered went the correspondence for one more day so that I could hit the phones to see what I could do to lend a hand to the relief effort being planned here in the Yucatan. 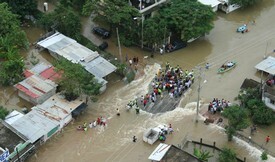 The situation in Tabasco is being described as the Katrina of Mexico. The center-city of Villahermosa is a complete disaster and as a result, those who have been forced to stay behind have nothing. The residents of Tabasco need drinkable water, powdered milk, towels, diapers, canned food, and lots of other basic items. The people of Yucatan are changing their plans to pitch in. Instead of buying food for their family, they’re buying supplies to donate as schools churches and government buildings have opened their doors to accept donations. 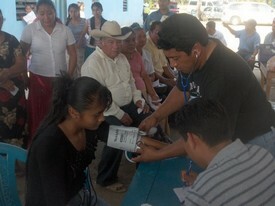 Specifically, the church leaders of Tabasco have asked for medical personal with medicines and vitamins to come and offer care. This is extremely important as the floodwaters begin to recede and diseases resulting from contaminated drinking water and inadequate services begin to appear. To respond to this request, God is calling on still others to change their plans. A relief corps of Christian doctors and nurses from Mérida are organizing now to travel in order to provide first-hand relief and the peace of God to those caught in the middle of this crisis. All of these health professionals are sacrificing family-time and their personal goals as they prioritize the needs of their countrymen. I’m happy to report that my change of plans brought about some tangible results, but a need this great calls out for so much more to be done. How about you? Do you feel God leading you to be a part of the relief effort? Comment or email us and we’d be glad to help you with your change of plans.